I scream, you scream, we all scream for ice cream! In case you’ve missed my adventures, I’ve been seriously craving ice cream while being pregnant in the summer. It’s such a tasty and refreshing treat! So, when Tiffany Wong Party reached out about a collaboration with her new product line, I knew what I was going for- ice cream!! This product line is perfect, since you can buy the full set in a party pack or buy each item individually to suit your needs. You also have the ability to mix and match! Once you purchase your party printables, they’ll come to you via a zip file for immediate download. Then, all you need is a printer, scissors, and cardstock to get started! (I use this printer and I love it. It does an amazing job of printing color and black/white, as well as copying photos! Also you can print wirelessly, which is perfect for us! We keep the printer on the second floor, and I’m usually on the couch on the first floor or working in the attic, so it’s easy to press print, then grab the papers later.) I also recommend a paper cutter and a paper punch just to make your life easier. You can cut all these items out in no time! Now let’s talk about the files. 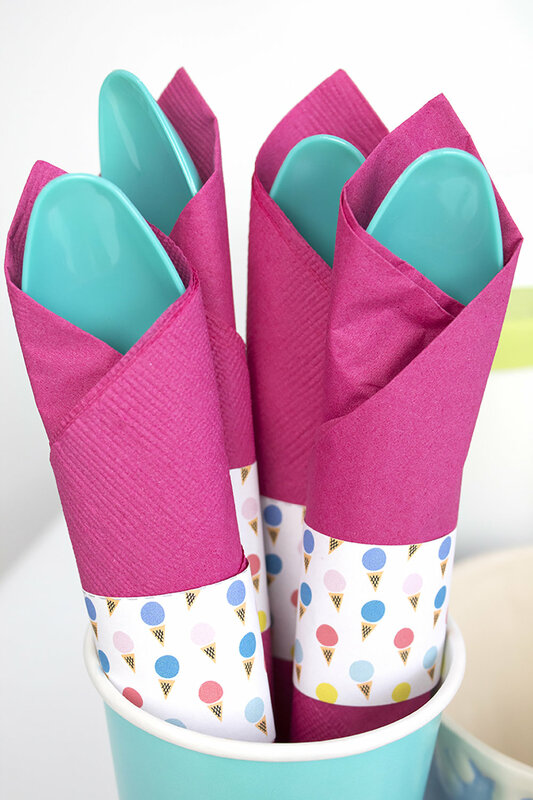 Some files come ready to use (like the cupcake toppers) and some require a bit of DIY work (like the banner). Then, you have the customizable ones like the tent labels. All I had to do was open the file, download the suggested font (written on the left hand corner) and add my own text. It was SO easy! Press print and bam, you’re on your way. Then, just cut everything out according to the instructions and your party is ready to go! These cupcake liners are perfect for adding a themed element to your cupcakes! I purchased store bought cupcakes (my #1 party hack!) and removed the summer-themed toppers they came with. 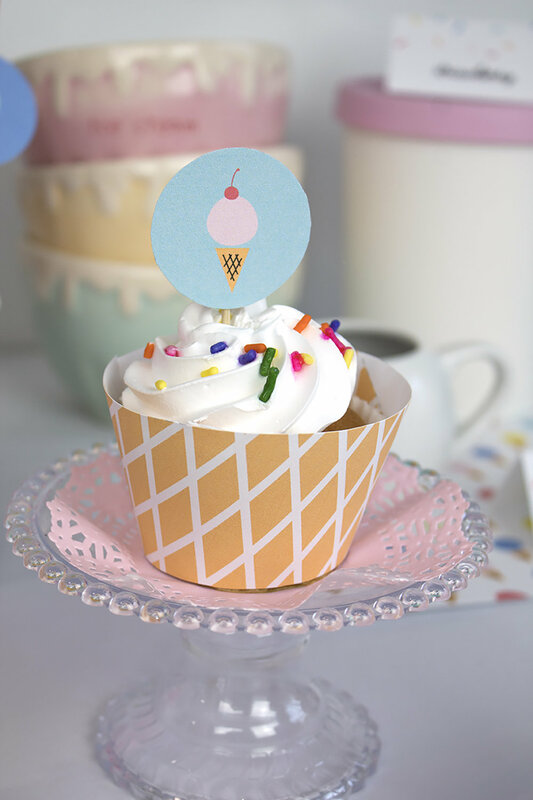 Tiffany created these adorable cupcake toppers in 1.5 inch circles. All you need is a paper punch and you’ll cut these bad boys out in no time! I actually messed up because I thought I had a 1.5” punch and didn’t (whoops!) so you can use a scissor as well. But, the lines won’t be as crisp and clean so I highly recommend getting a paper punch. Then, just hot glue the circle onto a toothpick and you’re ready to go! I always prefer paper straws over plastic ones, so I used these gold striped, coral striped, and aqua blue polka dot ones. To dress them up a bit, I added those same cupcake toppers and glued them onto the straws! It’s an easy (and free!) way to incorporate the theme. Some people hate paper straws but they’re biodegradable, unlike plastic straws. They’re also way prettier! For my backdrop, I used paper fans and tissue paper fans in all sizes. I added my YAY ice cream banner on top. Tiffany offers her banner with so many sayings, so it’s great for any occasion! For my party, I was just happy to get ice cream so I picked a simple YAY! I felt like a fancy restaurant using these napkin wraps! They’re so easy to use- just print, cut, wrap around your napkin, and add a little bit of hot glue. Easy peasy! I also used 2 of these taped together to dress up my cups. For those, I used a small piece of tape, but you could glue the ends together too. Tiffany also offers full pages of her patterns, so I used those to create a border for my letterboard sign and to create a colorful surface for my items. You could also print out a page and use them at each seat as placemats! These tent labels are great for marking which flavor is which, labeling what’s dairy free/nut free, or marking each person’s seat at the table. I went a little crazy marking everything down to the napkins, but the labels were so cute that I couldn’t resist! 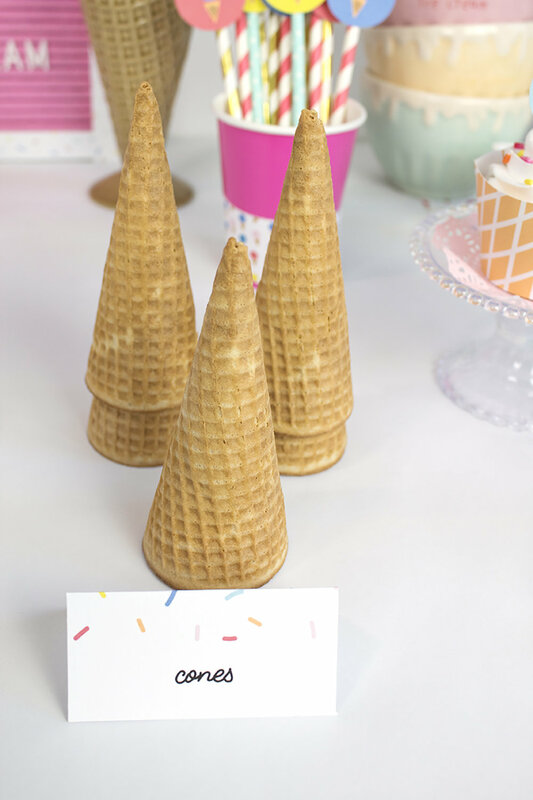 PS- one of my favorite elements that I added was this faux 2-scoop ice cream cone! It's a sundae dish I've had for years, along with 2 mini honeycomb balls, attached by a toothpick. Overall I found that Tiffany’s items were so cute and easy to use. I’ve never purchased a pre-printed set of party supplies before and I gotta say it was really easy to keep the whole party cohesive and within budget! Head over to the Tiffany Wong Party website to check out all the designs and plan your next party today! *This Party was done in collaboration with Tiffany Wong Creative. All thoughts and opinions are my own. Oh my gosh you guys! Have you even SEEN the adorable Art Class + Museum Of Ice Cream Collections at Target?! Literally so jealous that all these items are made for kids. They get ALL the good stuff! The good thing is that although they don't have any adult items (cue tears) they do have some awesome items you can use for yourself. Check out these items you can snag from the Art Class + Museum Of Ice Cream Collection that will be sure to add some sweetness to your wardrobe! Ok, fanny packs don't exactly have the best rep in the biz. They're best known for being a 90's staple, or something only tourists and dorky parents wear. BUT I think this fanny pack can change your mind! First off, it has gummy bears. Yum! And second, it's transparent and will blend in better with your outfit. They're really rocking' the clear trends with this collaboration! Note that since this is for kids, the waist strap may be a little short. Buyer beware! Man oh man do I love this lanyard! If you need to carry your ID card for school, work, or even going on cruises, you HAVE to get this sprinkle lanyard! It's such a perfect shade of pink, and it has a hanging ice cream cone. RUN, don't walk, to get it! If you don't carry an ID, it can be used for your keys, a mini-wallet for trips to the deli, or even at the gym! Let's be honest- we all LOVE enamel pins! These are perfect to use anywhere, for anyone of any size. Put them on your purse, your lapel, your jean jacket... heck, even store them as wall decor! This set features a cute-as-pie ice cream truck, MOIC signature banana, and a soft-serve cone for obvious reasons. Although it may be a little small, you can totally carry this mini purse around to the mall or on a small day trip! It'll fit the essentials- wallet, keys, lip gloss, and sunglasses. Plus it has a cute little sprinkle scarf and lining! This backpack is bananas! No but seriously, how perfect is this backpack. It's perfect for commuters to carry their books and a snack, or just for wandering around in the park. Take it along hiking or to grab a few items at Target- the choice is yours! It's perfect for casual Fridays or to look cute anytime. If ever there was a reason to bring your own lunch to work, THIS IS IT! Aside from being the freakin cutest little lunch bag, this comes with a soft-serve cone ice pack to keep everything cool. Bringing your own lunch saves money and the environment, since you won't purchase food that comes in one-time use plastics or styrofoam, then gets carried back to the office in a plastic bag. BTW- who do we have to contact to get these cute clothes in adult sizes?! Kids get all the good stuff! What do you think of this collaboration? Are you in love, or do you think it's nothing to brag about? Are you planning to get any items in the collection? Let me know in the comments below! 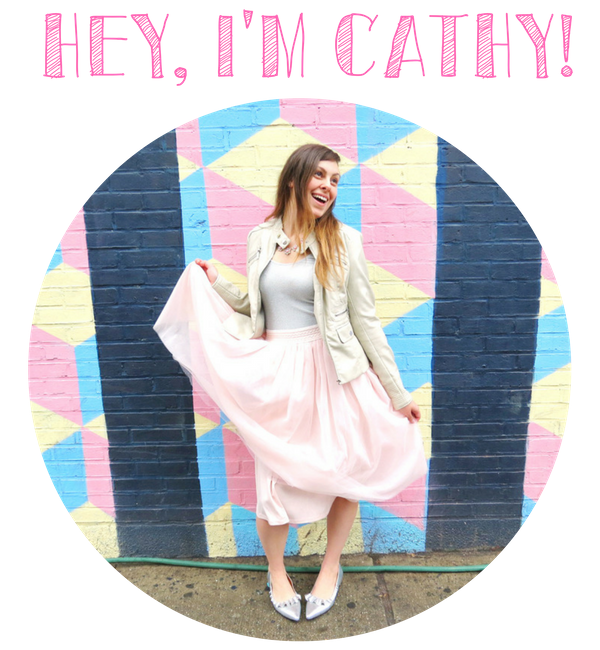 A month ago I celebrated my 27th birthday with a super fun Sugar Sweet Birthday Party. Armed with my pinterest board and list of tutorials, I created a DIY party that would satisfy any sweet tooth! I unfortunately had a really bad cold that day, which turned out to be sinusitis (and left me in bed for a week!) but I had SO MUCH fun planning this party and celebrating! I bought some pink balloons and made them into donuts using this tutorial. I painted the sprinkles on instead of using tissue paper to save some time. The balloons were a huge hit. Everyone loved them and was amazed by the shape, and that I made them myself! We have some hooks in our living room that the previous homeowners had left, so I hung up some lanterns and a disco ball. The party never transitioned into a dance party like I had hoped, but since I was super sick, I didn't really mind that. Over the fireplace, I hung a DIY tassle garland. It was super easy to make and added a fun touch. And what's a Sugar Sweet party without a candy bar?! I kept mine small since there weren't any kids, and I knew my friends wouldn't be eating too much candy. I still have a lot left! To create your own dollar store candy bar, check out my tutorial. I loved making this donut platter. It was a super fun and easy tutorial, and the tray can be used again and again. 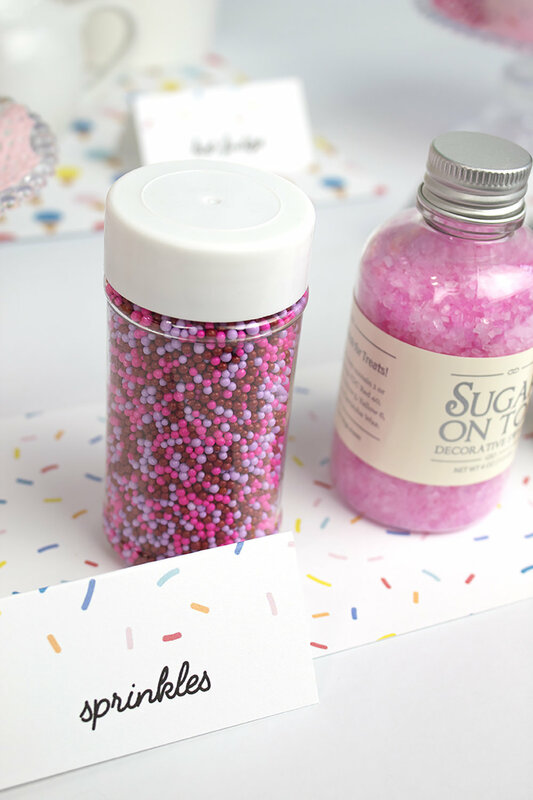 We rimmed some champagne glasses with sprinkles and added some cotton candy for a cute and a tasty beverage! Just pour some champagne over the cotton candy and enjoy. I made the festive 27 using sprinkles, mod podge, and cardboard numbers from the craft store. Everyone thought they were edible cookies! For some fun, we played drinking games using these donut playing cards. How stinking cute are these?! To add some color to the walls, I hung up paper fans all around the house. We don't really have much artwork up yet, so this helped make the room more festive. It also ended up being a great photobooth backdrop! I also got these inflatable ice cream cones that served as decor and photobooth props. They were inexpensive and well worth it! To set up the photobooth, I propped up my camera on my tripod and we hit the timer button. I really wish my clicker had arrived in time! I had a really great birthday, despite being so so sick. I just love planning parties! Be sure to follow my Sugar Sweet Party Pinterest board for more great ideas! I had no idea when I made this post (my second DIY blog post, ever!) that it would become as popular as it did. 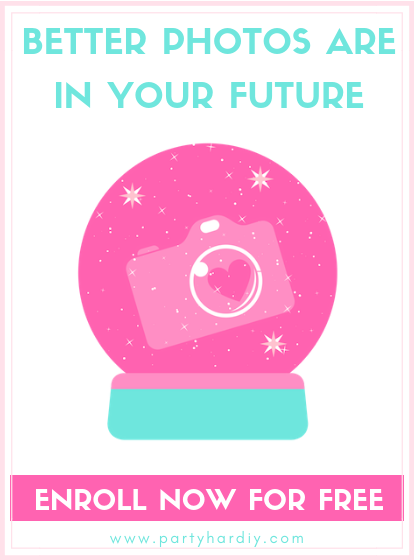 I’ve since updated some of the photos, and will soon be re-creating the DIY for you so that you can have much better images to work with! Thank you for loving the post so much. Please be sure to tag me when posting on social media, or adding your photo to the “tried it” section on Pinterest! For my birthday, I had a Sugar Sweet birthday party. I had so much fun planning and setting up for this party. It had everything you need for a sugar coma, including cotton candy champagne and a DIY candy bar. To add to the ambiance, I decided to make a fun donut platter! The great news is that the platter is food safe and reusable. So what are you waiting for? Go grab your supplies and lets get started! 1. Thoroughly wash and dry your platter. We'll be painting the underside. This is to make sure it's food safe! 2. Place the platter food-side down. Using the acrylic paint and a thin paintbrush, draw the sprinkles on first. I found that thicker, more opaque sprinkles showed better. Turn the plate over and make sure you're happy with the placement and quantity. Let dry according to directions. Did you make a sprinkle that's too fat or in the wrong place? Just wipe it off with water! Let dry according to directions. Then it's time for frosting! 3. If you're using a divided platter, fill in the gaps carefully first. You can be sloppy about it and wipe it off with a q-tip like I did, but that's much harder- learn from my mistake! Paint the frosting on in a zigzag shape. Let dry and add another coat to make sure it's thick. Be sure to turn it over and check for any gaps in the paint. Note: At this point, the paint is really delicate and scratches easily. Use caution when flipping it and maneuvering it. 4. Once your frosting is dry, paint the rim of the tray as your base donut color. If it's sheer, do another coat and let dry several hours or overnight if possible. 5. Put on a coat or two of mod podge. This will seal the design and make it waterproof. I did two coats, one going vertically and one going horizontally. And that's all folks! I think this would look adorable in a little girls' room holding their hair clips or for tea parties. How do you plan to use your new platter? Let me know in the comments below!